Coconut Meringue Pie is always a favorite in our house, but especially around Easter. I’m not sure why, but I’ve always associated coconut with the Easter holiday. Maybe because I remember as a child seeing it dyed green during that time and thought it was pretty. Speaking of Easter, it’s almost here and would you believe I have no idea what I’m cooking? I haven’t planned the first thing. That’s because for the first time in 34 years, I won’t have children or grands home for Easter. It feels funny to think about just the two of us on Easter, but you see, we’ve all been on the go so much over the past few weeks that we just decided it was simply too much for any of us to hit the road again this weekend. So that means it’s going to be just me and BeeBop. Just us two. 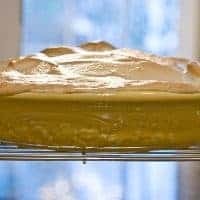 If you’re like me and haven’t done your menu planning for Sunday, this Coconut Meringue Pie would be a great idea for dessert. Yum. Coconut is one of my favorite flavors and just shouts “Hello, Spring!” to me. This is a very old-fashioned tasting, custardy coconut pie. It’s rich and good and all things wonderful. The filling is a luscious boiled custard with coconut added. 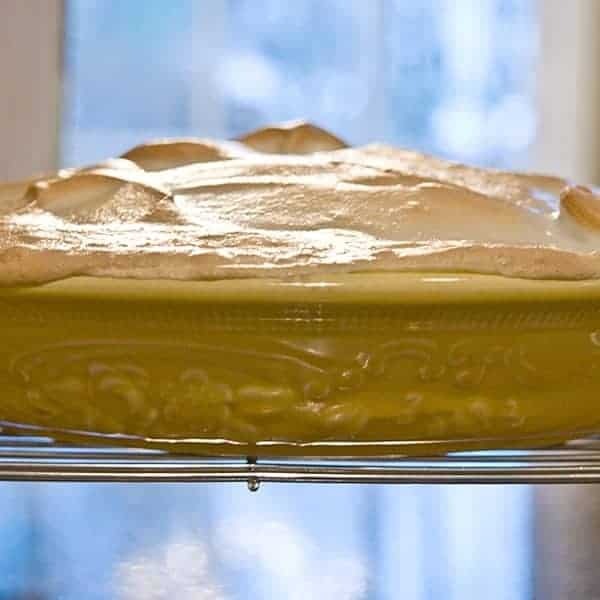 The meringue is piled high and sweet with that slightly toasted taste. What better ending for your Easter feast? I know I’ve told you all before that I cannot make a pie crust to save my life. If you can make one, please do! Otherwise, one of those nice refrigerated ones works great for this recipe. 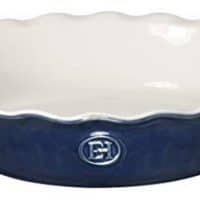 Start by placing your pie crust into a pie plate or pan and baking it according to the package instructions. Let it cool completely before continuing with the recipe. Separate the eggs. Lightly beat the yolks and set both aside for now. Next, mix the sugar, cornstarch and salt in the top of your double boiler. 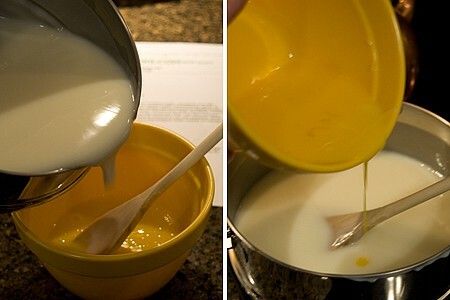 Place it over the boiling water and gradually add the milk. 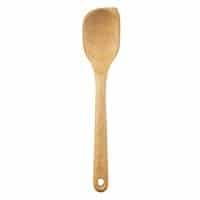 Cook this mixture, stirring constantly, for 10 minutes or until it has thickened. Slowly add a small amount of the hot mixture to the egg yolks stirring constantly. 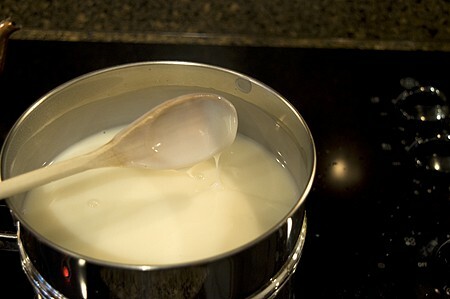 Add the tempered yolks back to the custard mixture and return the pan to the top of the boiling water. Continue cooking for 5 minutes. Remove from the heat and add the butter, vanilla and coconut. Stir together until well combined. Pour the custard mixture into the cooled pie shell. Set aside while preparing the meringue. Preheat the oven to 350 degrees. Beat the egg whites and cream of tartar on medium high speed of an electric mixer until light and fluffy. Gradually add the sugar and vanilla, beating until stiff and glossy. Spread meringue over pie filling being careful to seal the meringue to the edges. 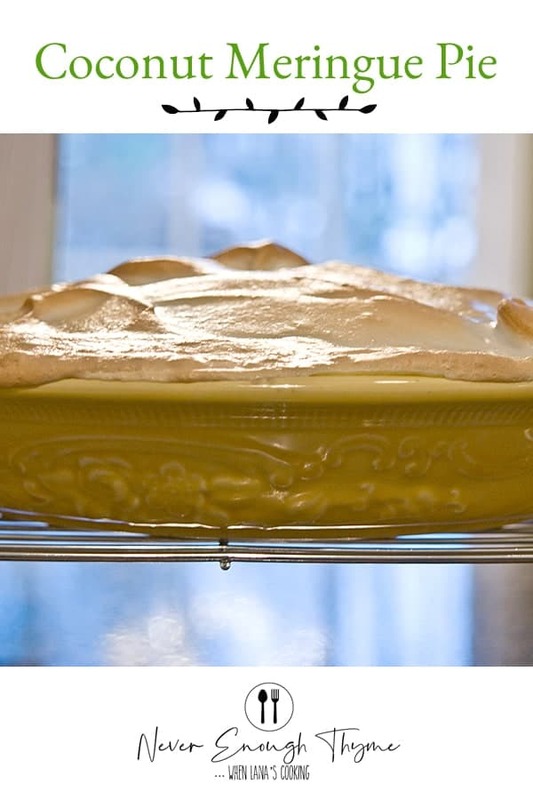 Bake for 10 minutes or until meringue is golden brown. Creamy coconut custard filling topped with a mile-high meringue. 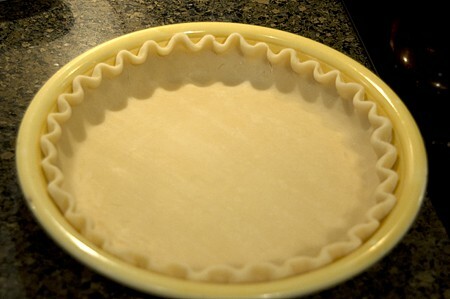 Place pie crust in pie plate and cook according to package instructions. Allow to cool completely. Separate the eggs. Lightly beat the yolks. Set both yolks and whites aside. 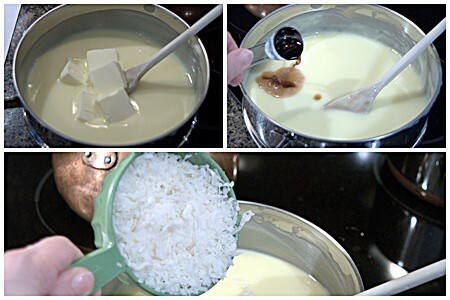 Combine sugar, cornstarch and salt in the top of a double boiler. 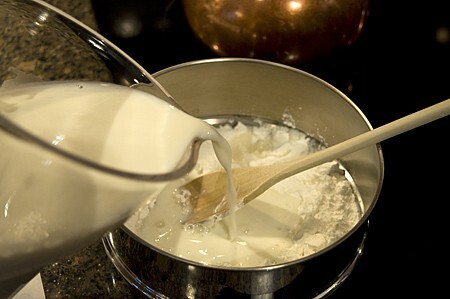 Gradually add milk and cook until thickened, about 10 minutes, stirring constantly. Slowly add ¼ of the hot mixture to the slightly beaten egg yolks stirring constantly. Return the pan to the top of the double boiler, stir in the tempered egg yolks and continue cooking for 5 minutes. Remove from heat. Add butter, vanilla and coconut. Stir together until well combined. Pour mixture into cooled pie shell. Set aside while preparing the meringue. Beat the egg whites and cream of tartar on medium high speed of an electric mixer until light and fluffy. Gradually add the sugar and vanilla, beating until stiff and glossy. Spread meringue over pie filling being careful to seal the meringue to the edges. Nutrition information is calculated by the MediaVine Create recipe plugin and may not always be accurate. Use your own judgment. Helpful hint — when you buy the rolled pre-made refrigerated pie crusts, you can use the rolling pin to stretch them out a bit to fit your favorite dish. Yes, but me and pie crust are not good friends. Even rolling it out…I don’t know. So you have the most important part figured out! Those lemon coconut macaroons sound great! I’d like to try them. What a pretty pie, Lana! It must be a little bittersweet to have the weekend to yourselves, but I hope you enjoy some relaxation time. This reminds me so much of Nanny….she made coconut cream pie often (she made a lot of pie!) and I loved it so much! It’s definitely an old-fashioned recipe. I’m sure my grandmothers and great-grandmothers all made a very similar one. It’s a pretty decadent pie. I serve really small wedges of it because it’s quite rich but worth a little splurge. love coconut ANYTHING Lana – including this pie!! Me, too, Debra. Coconut is just about my favorite flavor. My favorite coconut candy is those little old-fashioned caramel-y coconut haystacks. Hard to find them these days. What an awesome coconut pie, Lana. Coconut is such a wonderful, godsend ingredient! Easter blessings to you, too, Drick. Looks wonderful Lana. I’m having the same sort of weekend, my oldest daughter is out of town with the choir she leads singing at a different church and the youngest? Well, she’s in that space where she wants to spend the day with friends in the mountains. I’ve been invited to neighbors for dinner and I’m OK with not having to work all weekend preparing a feast. Happy Easter Lana! I am with you this Easter. No plans, no meals. It’s weird, but will be a day to catch up. Enjoy your day! Had no plans for Easter this year. My nephew Billy called and invited me and Polly to Easter dinner, hooray!!! Wish we could have had some of this mouth watering coconut pie. Looks delicious. Hope your week-end was restful. You’ve got my number with this delicious pie, Lana. We’re coconut fanatics at my house, and oh this would go down oh SO well! I just made this recipe for my Mom for Mother’s Day. It is her absolute most favorite pie in the world! It was a fantastic pie. When I cut her a piece the filling just spilled out all over the pie pan! :-( I am gonna make her another one…any suggestions? I cooked the ingredients for well over 20 minutes and it did not really thicken so I kept adding cornstarch…but I guess it still wasn’t enough. You expert bakers all feel free to chime in. 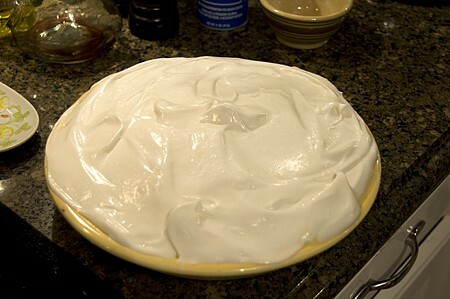 I’ve made a coconut merignue twice and the first time my meringue was a complete fail…now the filling. Helpful comments all welcome! Thanks all!!!! Oh wow, Sara, I’m so sorry you had a problem with the recipe! This is one that I’ve made several times and I’ve not had a problem with a runny filling. You do have to cook the custard until it is good and thick. I don’t think adding cornstarch is the solution. Sounds like maybe you didn’t have enough heat to thicken the filling properly. 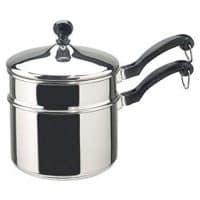 Was the water in the bottom of your double boiler at a good, steady slow boil for the whole cooking time? You do also have to be sure to let it cool completely. I would even refrigerate it overnight if the house is very warm. I did have it at a slow boil. However, I didn’t refrigerate it first because I read previously that the warm filling cooks the bottom of the meringue! Well, I konw it is something I’ve done and certainly not your recipe so I will do it your proven effective way! Thanks for a quick response. No, I didn’t mean to refrigerate it before putting the meringue on. I just meant to refrigerate the completed, cooked pie before serving. And although the filling does thicken up a little when it’s cool, you do have to be sure to get it quite thick while cooking.